The executive chef as well as a partner at three Danny Meyer-owned restaurants, including Gramercy Tavern, has just released a cookbook devoted to the art of cooking vegetable-based dishes. For Michael Anthony, this book, V is for Vegetables: Inspired Recipes & Techniques for Home Cooks from Artichokes to Zucchini ($25 at bn.com, hardcover), is his second. The first, published in 2012, was The Gramercy Tavern Cookbook. This time, Anthony said he wanted to focus on dishes that, while not necessarily vegetarian, are cooked around vegetables, instead of relegating them to sides. Both he and Meyer will be discussing the so-called “vegetable forward” concept, now a norm at two of Meyer’s restaurants, at an event at Barnes & Noble on November 30. Anthony also discussed the concept with Town & Village this week, saying the idea of the book was to make veggies enticing — and easy — for anyone to cook at home. V is for Vegetables is not however, a vegetarian cookbook. For Anthony, the effort to highlight vegetables came from wanting to prepare foods that were distinctly New York. In keeping with eating locally, shopping for groceries at greenmarkets or through a CSA is something Anthony recommends, adding that this can be done affordably with some planning. Anthony also delved into the subject of organic vs. inorganic vegetables and whether it really makes a difference. “It’s a question I get all the time,” he said, adding that while “it is a big deal,” he feels buying locally grown produce is more important than whether an item is organic. Anthony is also a fan of CSAs (Community Sponsored Agriculture) and gets a box of produce from a CSA he belongs to every Friday. In V is for Vegetables, he included recipes based on some of those items. He hasn’t forgotten about more traditional foods though. The book includes a recipe for coleslaw, which is actually inspired by a recipe from his wife’s grandmother. Anthony is hoping that the ease of the recipes will help home cooks resist the urge to cater to picky eaters by making different things for different members of the family, or just giving up and ordering out. He cited statistics that show Americans today eat more out of their kitchen than they do in their kitchen. “We go to restaurants or order out more than we cook our own meals.” The veteran chef added that he recognizes that for many, himself included, “It takes courage to cook. In V is for Vegetables, over 140 recipes are laid out from A to Z, and also include colorful illustrations painted by Anthony’s wife, Mindy Dubin. Dubin, Anthony and their children live in midtown Manhattan. When not there or at Gramercy Tavern, Anthony can also be found at Untitled, a new Danny Meyer restaurant at the Whitney Museum, as well as another less formal eatery in the same building, Studio Café. Anthony will be discussing and signing copies of his book and speaking with Meyer at the Union Square Barnes & Noble, 33 East 17th Street, on Monday, November 30 at 7 p.m. The Union Square neighborhood gave fall an early welcome last Thursday at Harvest in the Square, the annual culinary event that raises funds for the park’s maintenance and programming, this year bringing in $352,000 and over $5 million since the event began. The event celebrated its 20th anniversary this year and Coffee Shop co-founder Eric Petterson, who worked with restaurateur Danny Meyer of the Union Square Hospitality Group to launch the event in 1995, said he was happy with what it’s become. As part of a new program launched by Manhattan chef and restaurateur Daniel Boulud, on Tuesday, nearly 50 seniors in Stuyvesant Town and Peter Cooper Village had gourmet meals delivered to their doors that were prepared by five well-known, Manhattan-based chefs. 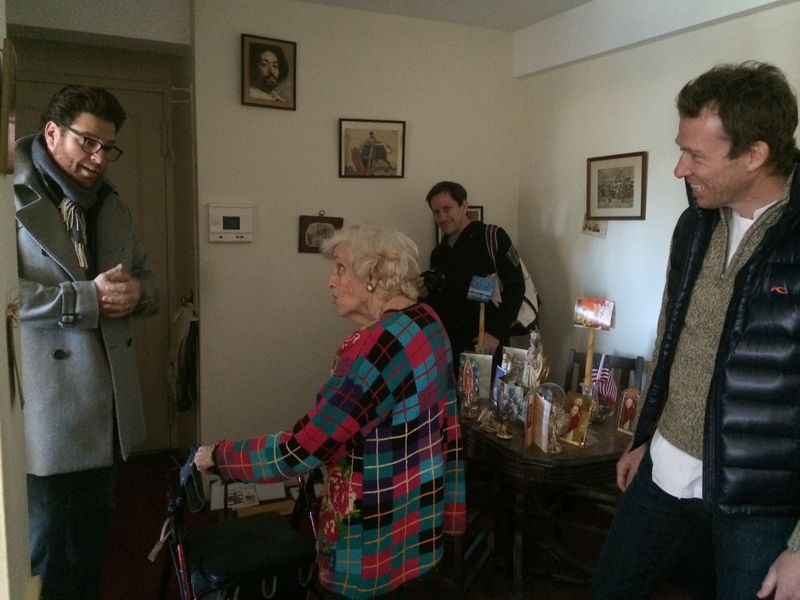 The residents were all recipients of meals that are regularly delivered by Citymeals-on-Wheels and on Tuesday, a handful of those meals were not only prepared by but delivered by two of the chefs, Ryan Hardy, who owns the restaurant Charlie Bird, and Scott Conant, owner of Scarpetta. The visits by chefs were part of a citywide, monthly event that was launched in January by Boulud, who’s also come to Stuyvesant Town to bring meals to homebound seniors. Boulud’s visit to the community was in the days before Christmas in 2012 and was done in partnership with Citymeals, which is an organization that delivers meals to seniors who are physically unable to shop or cook for themselves. In Stuy Town, there are 40 recipients of Citymeals deliveries; in Peter Cooper, there are seven. According to Beth Shapiro, Citymeals’ executive director, who also visited a few of those residents along with the chefs, the average age of those receiving meals, citywide, is 83 and more than half of those people are living at or below the poverty level. Income doesn’t factor into eligibility for getting meals though and Citymeals’ work is mostly privately funded (with just 10 percent of its budget coming from the government). Primarily, its mission is to feed New York’s homebound seniors on days when the city’s Department of Aging, via senior centers, does not, which are weekends and holidays. Boulud, who owns several restaurants, is also a co-president of Citymeals’ board of directors. 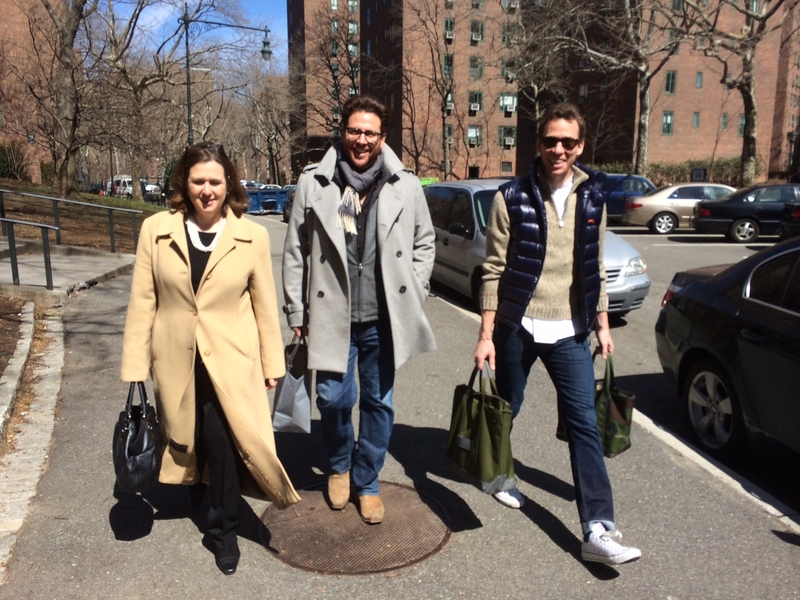 For Hardy and Conant, the delivery trip to Stuy Town was a first, but both indicated a desire to return to deliver again. Alongside him was Hardy, who’d brought trays of roast chicken with farro salad. “We both own Italian restaurants,” Hardy said in response. “You should join us,” Conant added. However, that didn’t seem likely after Petrone informed them that she had arthritis, which was getting worse and was also still recuperating from a cancer-related operation she got two years ago as well as glaucoma in her right eye. Still, Petrone said she still exercised faithfully every day and tried to get outside for appointments. The chefs didn’t argue and soon they were heading off for their next delivery at the apartment of another resident in the same building, Catherine Sweeney. Once inside the chefs commented on a photo of Leonardo DiCaprio that was tacked up on the wall outside the kitchen. There was also no shortage of smiles during the last delivery of the day for the chefs when at the apartment of another resident, Catherine McCloud. McCloud had also been to Italy, she informed them, having studied there for conservatory “in the beginning of time,” she joked. “The 50s.” While there she also found that though she’d complain of being sick of “pasta and red sauce every damn day,” whenever she went home to cook, that’s what she’d instinctively end up making. “I couldn’t do without it,” said McCloud with a chuckle. In her case, she became a Citymeals recipient after getting cancer. She’s also had a husband, an actor whose picture was opposite the couch on the wall, who suffered a bad stroke. When she told him about her own illness, she recalled how his response was to be “annoyed” since he would no longer get to be the center of her attention. McCloud also noted that she thought an important part of life was eating well. Including the aforementioned residents, 425 seniors living throughout the boroughs got meals on Tuesday prepared by chefs such as Marc Forgione of American Cut, Michael Anthony of Gramercy Tavern and Amanda Freitag of Empire Diner, along with Hardy and Conant. Since January, different chefs have lent their talents to Citymeals on the first Tuesday of each month.